The North African hare Lepus sp. 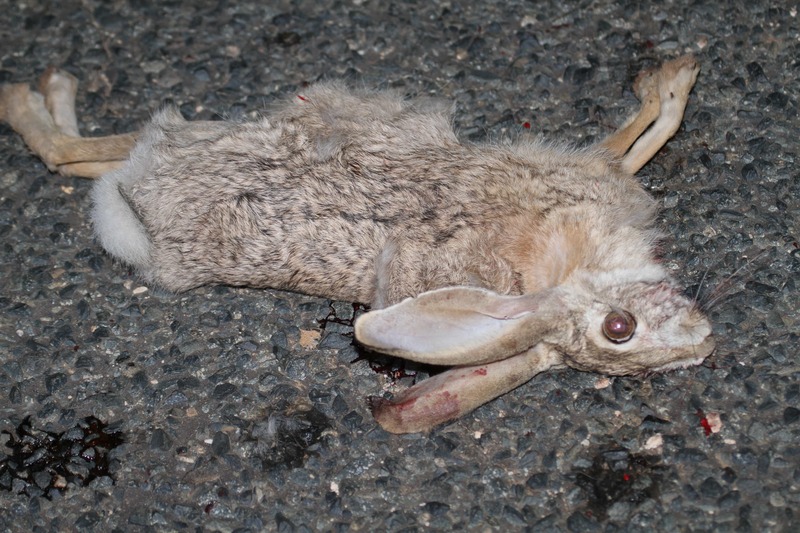 fauna is currently represented by two species – Cape Hare Lepus capensis and African Savanna Hare Lepus microtis. Within the Western Palearctic zoogeographic region L. capensis is currently distributed throughout eastern and northern Egypt, northern areas of Libya, throughout northern Algeria and with an isolated population in the south, and throughout Tunisia (Flux & Angermann 1990 – see www.iucnredlist.org for a distribution map). Scattered populations are also present throughout the Middle East and on the Mediterranean islands of Cyprus and Sardinia. In Morocco, its distribution extends from the Mediterranean coast southwards throughout much of the country excluding the far southeast, and down through large areas of Western Sahara to reach its southern limit just south of the Tropic of Cancer. Many authors (e.g. Petter (1959) and Slimen et al (2005 & 2008)) consider Cape Hare to be conspecific with European (Brown) Hare. Within the same zoogeographic region L. microtis has a small, isolated population in eastern Algeria whilst its large sub-Saharan range extends north through western Mauritania to incorporate the southern third of Western Sahara where this species may be sympatric with L. capensis. In a recent paper Chevalier et al (2012) assigned all hares within the Oued Ad-Deheb region (incorporating Dakhla, Aoussard and Bir Anzarane) of Western Sahara to L. capensis with no mention of L. microtis. Over the course of four expeditions to the region between 2006 and 2012 (8-18th March 2006 (Richard Moores and Dr Alexander Lees), 20-27th January 2010 (Richard Moores, Dr Alexander Lees and Daniel Brown), 24-31st January 2012 (Richard Moores, Daniel Brown and Robert Martin) and 12-19th February 2012 (Richard Moores and Amandine Rouyer)) we have observed numerous hares and those seen sufficiently well to be identified were all assigned to L. microtis (and not L. capensis), with identification based primarily on the presence of an obvious russet area on the nape (see Figures 1 and 2), a view supported by the IUCN distribution map. In 2012 we were able to examine a freshly dead road-killed specimen approximately 44 km northwest of Aoussard on 29th January which permitted a critical examination of identification features. Figures 2 and 3 illustrate the russet area on the nape of the neck (which is often more obvious in the field and may be bleached by flash in the photograph (see Figure 1)) in addition to russet pelage on the chest sides and legs. L. capensis do not show such areas of russet. L. microtis also has more coloured and ‘rougher’ fur than Cape Hare and this coarseness of the fur can be seen clearly in Figures 2 and 3. The in situ digital images obtained of this specimen permit an appraisal of the dentition (Figure 4). 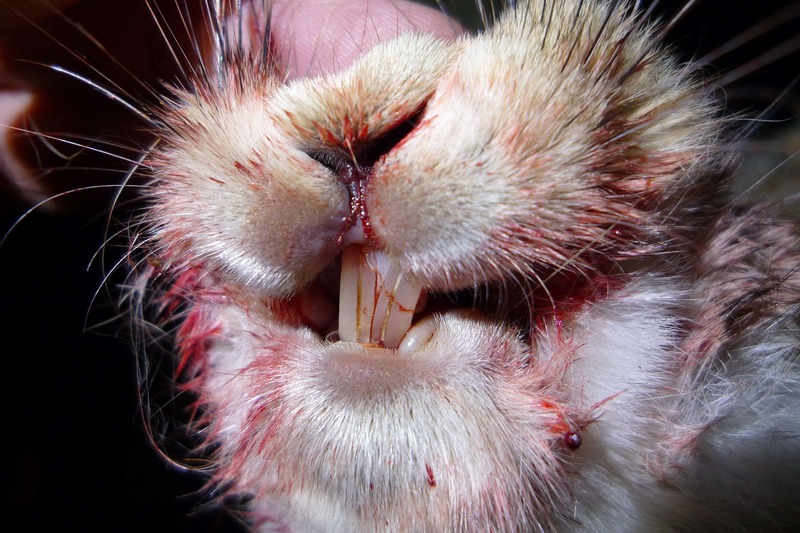 The incisors of L. microtis have deep grooves, shown clearly in Figure 3, a feature not shared by Cape Hares. Figure 5 shows a spot on the forehead, a feature shown by many L. microtis but ‘rarely’ shown by L. capensis (Aulagnier et al 2008). The freshly dead individual illustrated above shows a suite of features currently regarded as diagnostic of L. microtis and not L. capensis. This identification conforms to the distribution map accepted by the IUCN and contra Chevalier et al (2012) who considered all hares in the Western Saharan region of Oued Ad-Deheb to be L. capensis. We do not subscribe to this view and moreover believe their accompanying image documents L. microtis rather than the Cape Hare as captioned, given the obvious russet on the neck, breast sides and legs. 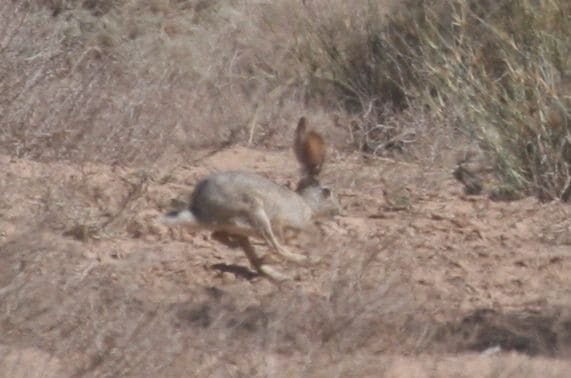 We believe that the distribution of L. microtis to be underestimated and in both 2006 and 2012 we observed hares with distinct russet napes throughout Western Sahara and even into southern Morocco. These included individuals near to the mouth of the Oued Draa 9 km northeast of Tan-Tan in March 2006, and along the access track to Fort Bou Jerif, approximately 30 kilometres northwest of Guelmim in both January and February 2012). Whilst the presence of a russet nape mark on these individuals would suggest L. microtis, we were not able to inspect other diagnostic features and confirm our suspected identifications. 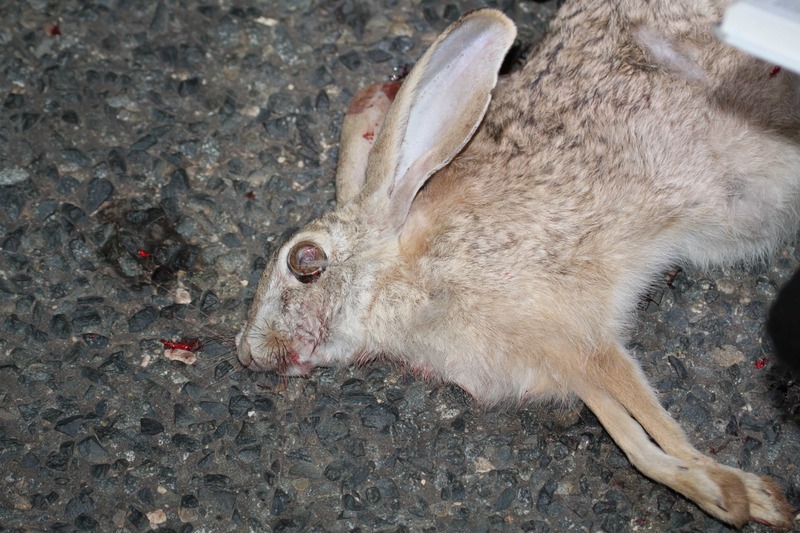 We would urge all naturalists visiting Morocco and Western Sahara in the future to pay closer attention to any hares they encounter; particularly dead individuals which obviously allow close examination (particularly of the important incisors), and obtain extensive photo-documentation to enable the distribution of both species in the region to be better qualified. Aulagnier, S., Haffner, P., Mitchell-Jones, A.J., Moutou, F. & Zima, J. (2008). Mammals of Europe, North Africa and the Middle East. A&C Black publishing, London. Chevalier, F., Thevenot, M. & Bergier, P. (2012). Notes sur quelques mammifères terrestris observes près de Dakhla, Oued Ad-Deheb. Go-South Bulletin (2012) 9, 1-6. IUCN (2011). IUCN Red List of Threatened Species. Version 3.1. <www.iucnredlist.org>. Downloaded on 22 February 2012. Petter, F. (1959). Eléments d’une révision des lièvres africains du sous-genre Lepus. Mammalia 23: 41-67. Slimen, H.B, Suchentrunk, F., Stamatis, C., Mamuris, Z., Sert, H., Alves, P., Kryger, U., Shahin, A. & Benammarelgaaied, A. (2008). Population genetics of Cape and Brown Hares (Lepus capensis and L. europaeus): A test of Petter’s theory of conspecificity. Biochemical Systematics and Ecology, Volume 36, Issue 1 pages 22-39. Slimen, H.B., Suchentrunk, F., Memmi, A. & Ben Ammar Elgaaied, A. (2005). Biochemical genetic relationships among Tunisian Hares (Lepus), South African Cape Hares (L. capensis), and European Hares (L. europaeus). Biochemical Genetics, Volume 43, Nos. 11/12. This paper has been reproduced from Go-South Bulletin from which it was originally published. Many thanks to Patrick Bergier and the Go-South Team! In these encounters, hares stand upright and attack each other with their paws, a practice known as “boxing”, and this activity is usually between a female and a male and not between competing males as was previously believed. 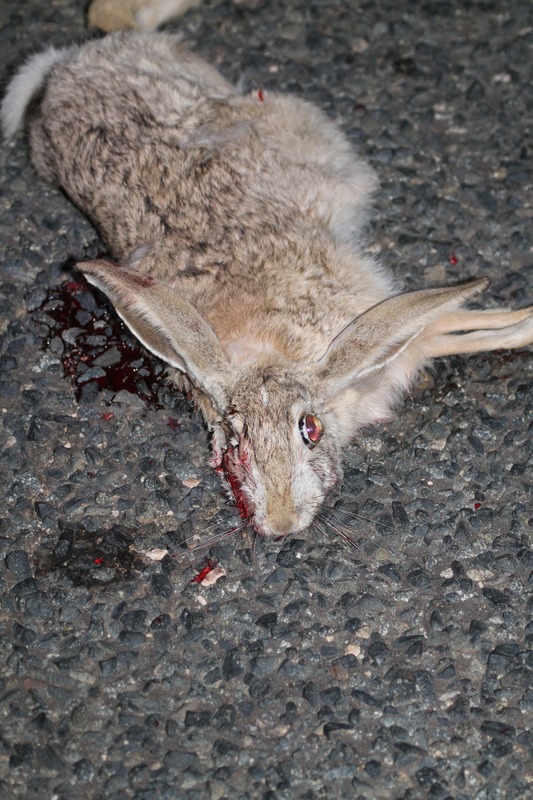 Although hares are shot as game when they are plentiful, this is a self-limiting activity and is less likely to occur in localities where they are scarce.